On a day when the rest of the nation tuned into their televisions, glued in on the NCAA Tournament selection show as the field of 68 was selected for the upcoming men’s basketball tournament, in Hudson Wis., the focus was on hockey and their native son who was fighting for his postseason life as well. It was the final game of a three-game series in round one of the Hockey East Tournament, and both UMass Lowell and Boston University were tied one game apiece. Winner moved on. A loss would most likely end their season. 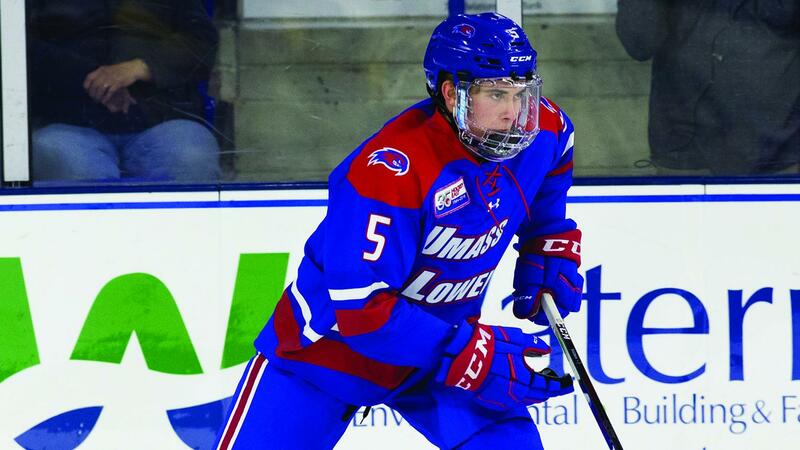 Gliding across the ice, dressed in the UMass Lowell blue, white and red uniform was Hudson’s own Chase Blackmun. With every shift, the city of nearly 13,000 held their breath. As he goes, they go. As they go, he goes. It’s the kind of connection that goes well beyond wins and losses, specific age groups and the 1,367 miles that separates Lowell, Mass., and the heartbeat of St. Croix County. It always has and always will. Monitoring the game from her phone was another Hudson product who shares her own special connection to the city. Just because her season had come to a close didn’t mean she wasn’t invested. 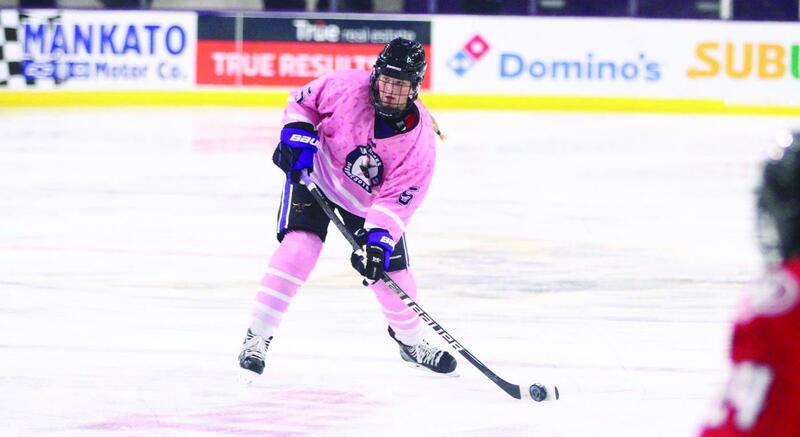 Fresh off her first season as a defenseman for the Minnesota State Mavericks, former Raider Anna Wilgren’s season came to an end in early March after MSU lost to Ohio State. The setback capped off Wilgren’s first season playing in arguably the toughest conference in women’s hockey. Despite that, all she did was play her way onto the WCHA All-Rookie Team after scoring four goals and eight assists. She also led the entire league in blocked shots, and with every block, the city cringed right along with her. When you take into account Blackmun and Wilgren’s achievements at the Division I level, along with the recent success of the Hudson youth programs and high school teams, it’s hard to ignore what has been happening – and what is continuing to happen. No wonder the city nearly closes down when one of their own is on the national stage. 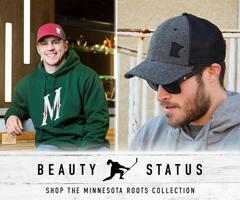 If Minnesota is the State of Hockey, Hudson just might be the Hockey Hub of Wisconsin. “It’s an honor. To wear the Hudson jersey for the four years I was there was incredible; to play in front of your hometown fans and play with all of those kids you grew up with. Playing with your buddies was something that was really special,” said Blackmun, now a freshman defenseman for the River Hawks. “Just to be a part of that program and to maybe be a role model to some of the younger kids and show them that even though it’s ‘Wisconsin hockey,’ it’s a still a good level of play. As Blackmun puts it, success breeds success and everything begins and ends with those building the foundation one brick at a time - people like Hudson boys’ head hockey coach Brooks Lockwood and his staff, including former Hudson star, Badger and NHL veteran Davis Drewiske. Ever since taking over in 2012, Lockwood and his support staff have slowly put their mark on the program – and ultimately the city – by emphasizing the power of building within. Then, when the pieces are built, keeping them at home as opposed to watching them go someplace else. Anyone who knows Hudson hockey is well-aware of the struggles the program has had in the past when it came to losing players to other programs at the absolute worst time. Whether it’s a junior program or greener pastures in Minnesota (at least that was the thought), Lockwood has battled the stigma of “small town hockey” ever since he became the Raiders’ bench boss. Then came players like Blackmun and Wilgren. Talented beyond their years, when others left, they stayed. It was a perfect storm and even better timing. Led by a slew of talented players who were developed at home, the Hudson High School hockey programs exploded onto the statewide hockey scene. What’s followed were two state titles by the boys’ program (2016-17 and 2017-18), a second-place finish at state in 2015-16 and most recently, another state tournament berth this past season – their fourth straight trip to Madison. Dating back to the beginning of the 2015-16 season (Blackman’s junior year), the boys’ program is now 96-18-3. Meanwhile on the girls’ side, the Raider program is coming off a season where the navy, blue and white lost in overtime to Appleton in the state title game. It was the Raiders’ fourth trip to state as a program but their first state appearance since 2006. Back on the map, both locally and beyond, thanks in large part to players like Blackmun, Wilgren and Jordan Halverson (who currently plays for the Janesville Jets of the NAHL and is expected to forge his own journey through college hockey one day soon), just to name a few. Even though Blackmun’s squad ended up losing to Boston University that night – essentially ending his freshman season (UMass Lowell is not expected to receive an at-large bid in the upcoming NCAA Tournament) – his mark on the River Hawks’ program was staggering when you consider that the rookie skater was going to work night in and night out in Hockey East which is historically one of the toughest conferences in all of college hockey year after year. Blackmun tallied five goals and added nine assists. Those 14 points put him second on the team in scoring among freshmen and second in scoring on the team among defensemen. A former Davis Drewiske Award winner – given to the top senior defenseman in the state of Wisconsin – registered 12 points over his last 15 games and was named Hockey East Rookie of the Week in late February thanks to a four-point weekend against Merrimack. Blackmun’s freshman experience was so effective that he even earned himself a spot on UMass Lowell’s power-play unit at the end of the season, grabbing the first power-play goal of his career against BU. As for Wilgren, confidence and competiveness often go hand-in-hand. Wilgren takes competiveness to a whole new level. Skating for a young and up-and-coming Minnesota State program, Wilgren was one of the glaring bright spots for head coach John Harrington when looking back on the 2018-19 season. Never one to shy away from a challenge, Wilgren brought her Hudson pedigree to the WCHA and immediately made an impact. “My teammates helped me and they gave me a lot of confidence,” Wilgren said. “Even from the very beginning, they assured me that I would be able to adjust and they believed in me. I am also super competitive which helps in every aspect of life, but especially in hockey and adjusting to that next level of play. It helped me realize there are players out there who are better than me and I am going to have to work even harder to play with them. “I also think my time playing at Hudson helped me prepare for where I am now. I would not have changed anything from my high school experience. I am still best friends with pretty much all of my teammates from high school and I had amazing coaches. Momentum takes time, but once it starts, it’s hard to stop. From top to bottom, the Hudson hockey program is rolling ... and watching.